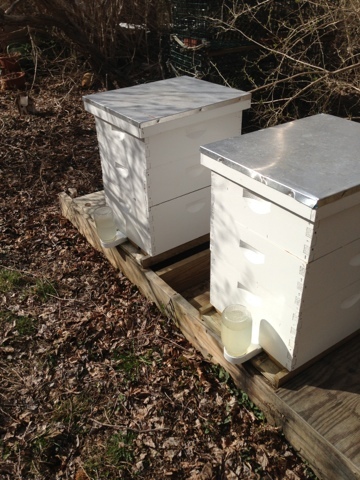 It's been a long winter and a couple of weeks ago started feeding the hives some sugar water to make sure they get a good start this year. 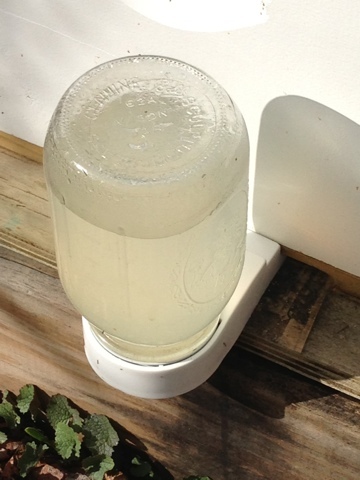 I use external mason jar feeders. 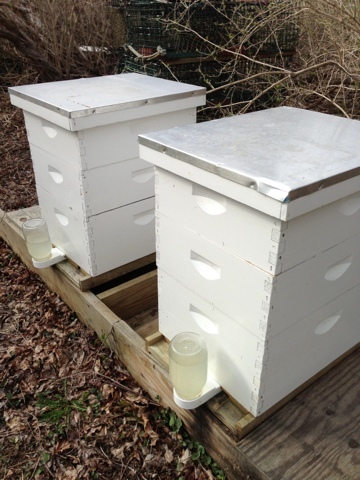 I tried a hive top feeder and honestly, I didn't like it because so many bees drowned in the sugar water. I like keeping things easy and I also like watching the bees to make sure they are ok so the entrance mason jar feeders work really well. The fact that they are so inexpensive helps too!! My hive top feeder is just hanging on a shelf in my bee house. That's how much I don't like it. Add Sugar to near boiling water and mix with a wire whisk to dissolve sugars. I just mix it all up in a large stainless steel pan in my kitchen. Let cool. I add 4 teaspoons of ProHealth Feeding Stimulant with Essential Oils to the cooled sugar water. There is Lemongrass and Spearmint Oils in this mixture and the Bees really like it. I also spray a mixture of ProHealth and water in a spray bottle on the supers and frames when I put on a new super. 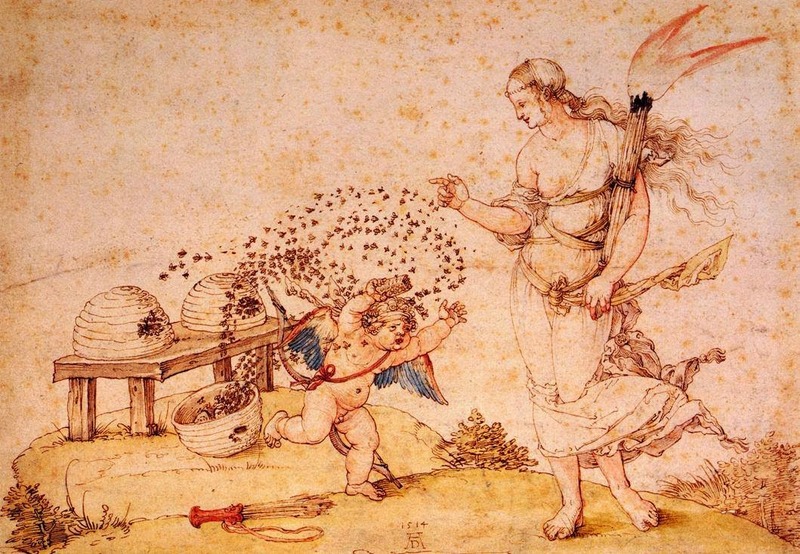 It really helps the bees to start production on the frames right away. 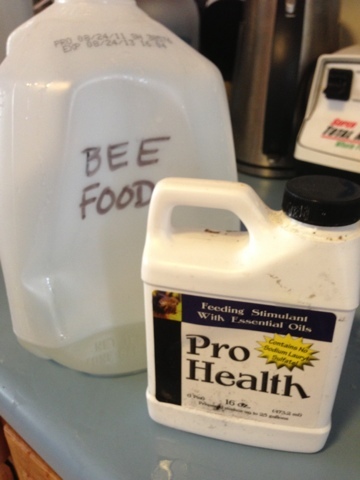 I store the Bee Food in Spring Water Jugs in a cool place and it lasts for about 2 weeks. I like the Rapid Feeder (Bee Works http://www.beeworks.com/catalog/index.php?main_page=product_info&cPath=1&products_id=14. 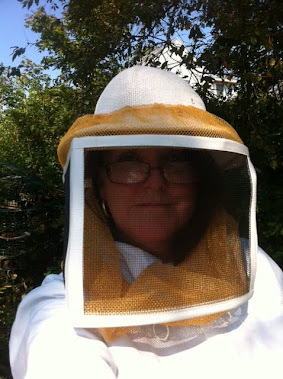 You put it over the inner cover in an empty super and can fill it without disturbing the bees. I think Ruhl Bee Supply has something similar.